SAN FRANCISCO — The U.S. Air Force is preparing to establish a new service for secondary payloads. Starting in 2014, the service plans to conduct annual flights of an adapter designed to mount six secondary payloads on Evolved Expendable Launch Vehicles (EELVs), the rockets the U.S. government relies on to send large satellites into orbit. Since Wynne issued that memo, only one ESPA ring has flown. 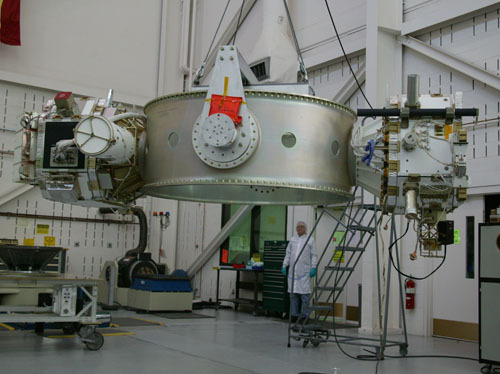 In 2009, NASA used the excess lift capacity on an Atlas 5 rocket carrying its Lunar Reconnaissance Orbiter to launch the Lunar Crater Observation and Sensing Satellite (LCROSS). To look for water ice buried in lunar craters, engineers from the NASA Ames Research Center and Northrop Grumman Corp. fitted an ESPA ring with sensors, antennas, propulsion, communications and navigation systems to gather information as the Centaur upper stage and then the LCROSS spacecraft crashed into the lunar surface. Government and industry officials offer several explanations for the slow adoption of ESPA rings. Some of the customers who pay launch vehicle providers to send their billion-dollar satellites into orbit are reluctant to share the ride with small satellites for fear those missions could cause delays in the primary satellite’s integration and launch. At the same time, some small satellite developers have so little funding they are looking for a free ride into orbit and cannot afford to pay even a small fraction of a large rocket’s launch cost. Nevertheless, interest in ESPA missions is growing as new entrants shake up the launch vehicle industry. “There has been an uptick in ESPA activity in the last three to six months,” said Joe Maly, ESPA product manager for MOOG CSA Engineering of Mountain View, Calif., the firm that developed ESPA rings while working under contract for the Air Force Research Laboratory in the 1990s. Maly attributed some of that activity to the competitive launch market. Both the Falcon 9 rocket built by Space Exploration Technologies Corp. of Hawthorne, Calif., and the Antares rocket built by Dulles, Va.-based Orbital Science Corp., the two vehicles selected by NASA to ferry cargo to the international space station, are designed to be compatible with ESPA rings. In addition, companies are developing more capable ESPA variants. Initially, ESPA rings were simple devices designed to mount six payloads weighing 180 kilograms each between the primary payload and the upper stage of an Atlas 5 or Delta 4 rocket. “Now, customers want their own avionics, solar arrays and ability to maneuver in orbit,” Maly said. Seattle-based Spaceflight Inc. is marketing space for secondary payloads on Falcon 9 flights. The payloads would fit on a Spaceflight Secondary Payload System (SSPS), a ring similar to ESPA that features avionics, power and telemetry systems to support five payloads weighing as much as 300 kilograms. In addition, Spaceflight and its sister company Andrews Space are working to develop Sherpa, an in-space tug and satellite platform that adds capability to SSPS to move secondary payloads from the place where a primary mission drops them off to their desired orbital slot. Orbital also announced plans in October to develop an experimental platform designed around an ESPA ring under a five-year, $32 million contract awarded by the Air Force Research Laboratory. The ESPA Augmented Geostationary Laboratory Experiment Platform will be designed to host six payloads in geosynchronous, geostationary or low Earth orbit, Orbital said in an Oct. 24 statement. ULA is expanding its secondary payload services. “We have developed a number of concepts to utilize some of the excess performance and volume on launch vehicles,” Taliancich said. On Sept. 13, an Atlas 5 rocket carrying a classified National Reconnaissance Office (NRO) payload also launched 11 cubesats. The miniature satellites were enclosed in the Centaur upper stage Aft Bulkhead Carrier, an external platform developed by NRO and ULA to accommodate secondary payloads with a maximum weight of 77 kilograms. ULA is offering space for secondary payloads of different shapes and sizes on a variety of internal and external platforms. The company can accommodate secondary payloads ranging from one-kilogram cubesats to 5,000-kilogram satellites that could be sent into orbit alongside another large spacecraft in a dual-launch configuration, he added.